Gravity is the only force you need to simulate. The other two forces are just other ways of looking at the same thing. Anyway, it seems that binary systems always collide after a while, and that none of them is "stable"
Heh, yep, you can't get stable orbits if you have both gravity and some additional inward or outward force. The centripetal force is just another definition of the force acting upon an object which is undergoing circular motion. You can find that the magnitude of the centripetal force is v2/r, but that doesn't tell you what the force actually is. You have to realize that in this case, it is being supplied by the gravitational force -- they are the exact same thing! So if the universal law of gravity is simulated in your program, then the centripetal force is already implied anytime you've got objects moving tangentially to one another. You don't have to include it again, or it will break physics, as you can see with your results there. Another fun way to break physics is to change the inverse square law. E.g. make the gravitational force scale as r-1, r-3, or r-1.99 instead of r-2. You'll find orbits are extremely unstable even for very tiny changes in the exponent. In that case something must be going wrong with the way the positions are calculated at each time step. The time step itself is clearly not the issue because the trajectories appear smooth, but obviously two co-orbiting particles should not spiral in over time. (The other objects you introduced in the video don't matter, right? This behavior occurs even if you have only two objects?) Also, are there ever cases where a binary spirals outward over time? Something you could try to test is if the simulation is conserving momentum. 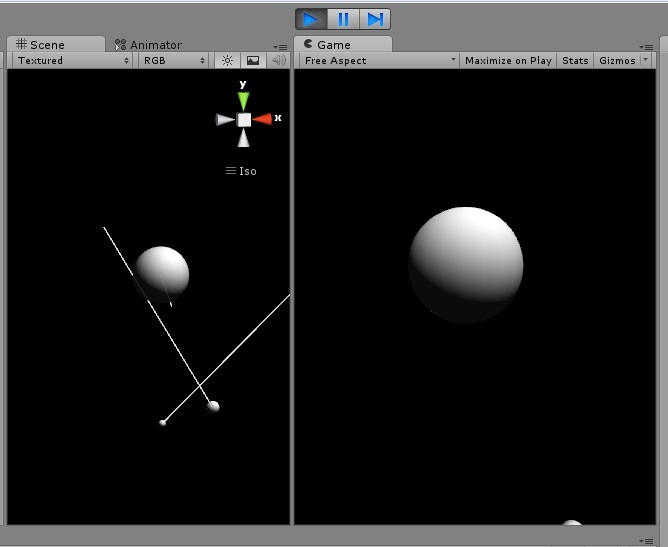 Set up two objects with antiparallel velocity vectors, and balance the momenta. I.e. have m1v1 = -m2v2. Depending on the ratio of masses and velocities, they should either collide before the first pass, or fly off toward infinity, or follow a static binary orbit. If momentum is indeed being conserved, then the center of the pair (or the body left over after they collide) should never drift relative to the camera. All universes have a blue line. Our real one does. Salvo's does. Mine does. Even SpaceEngine does- we just haven't found it yet. It is always there, no matter what. There are an infinite number of universes and the blue line exists in all of them. It is truly infinite; it is like a god. Are you using standard Unity physics, or completely your own calculations? Because in Unity there are some damping coefficients, that reduce speed over time. Harb, you didn't knew about this? All universes have a blue line. Some more timelapses from my archive. Similar to those posted previously, but hopefully not reposted.